I LOVE biscotti! If you have ever had the pleasure of dipping an after-dinner biscotti in a little cappuccino in a romantic little Trattoria in Italy, you’ll feel the same way about these! These little Italian cookies are unique and absolutely delightful. They are a bit of a “production” to make, I have to admit, certainly not typical of my other recipes. The word Biscotti, literally means baked twice, so that’s exactly what you need to do, but really, it is worth it!! I use white flour (as opposed to my usual whole wheat pastry flour) in these because nothing else will do! I have tried, believe me, but wholegrain flour doesn’t leave these crunchy as they should be, so I gave in! I don’t feel too bad about it because these are plenty nutritious otherwise: They are filled with nuts, have no other added fat, they are relatively low in sugar, and I use dark chocolate of course. They are perfect! 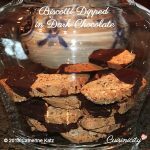 I use a little baking soda in these--so unlike me!--but found that it was necessary to get the perfect crunchiness in these biscotti. Place the nuts in a food processor and pulse just to chop them coarsely and set aside. Place the egg, egg whites, vanilla and sugar in the bowl of a electric mixer and beat until creamy. Add 2 cups of the flour, baking soda and beat again. Using your hands, add no more than ⅓ cup additional flour and gently incorporate, a little bit at a time as you handle the dough so it doesn't stick to your fingers --but don’t handle the dough too much, or it will get sticky again and you’ll have to add more flour--which you do not want to do, to make sure your biscotti stay nice and crisp. 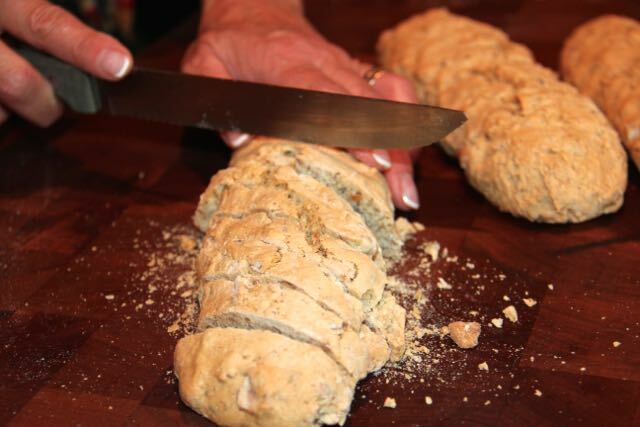 Divide the dough into 3 equal parts and with floured hands (part of that additional ⅓ cup), form each piece of dough into 3 logs--about 10 inches long and 2 inches wide and flatten the top a little bit, with the palm of your hand. Place the logs on a floured baking sheet and bake in preheated oven for 40 minutes. Remove and cool for 10 minutes. While the logs are cooling, reduce the oven temperature to 275. Once the logs have cooled off enough to handle (about 10 mn), cut into diagonal slices (about ¾ inch thick) --see photo below--and place back on the baking sheet. Bake for an additional 15-20 minutes. Meanwhile, break up the chocolate in a microwavable cup and heat on high for 1 minute. 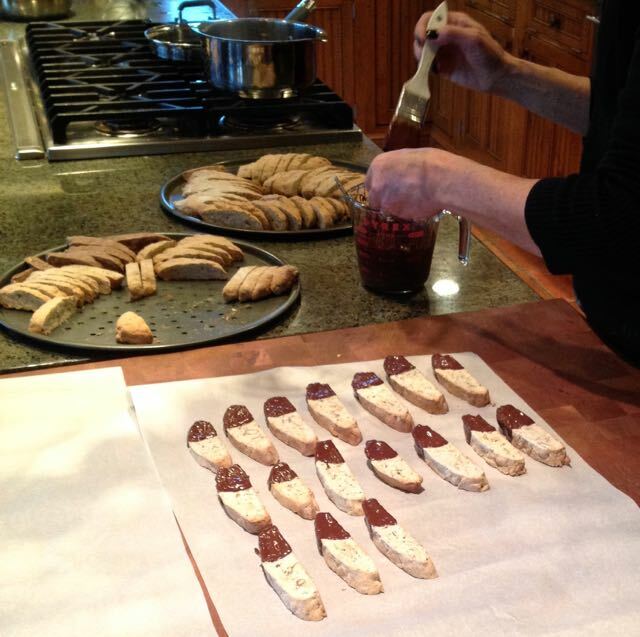 When the biscotti have had a chance to cool off, using a pastry brush, "paint" the chocolate on half of each biscotti, making sure to leave the bottom "unpainted". Place the biscotti on a flat plate with the "unpainted" side on the bottom so it doesn't stick to the surface, when refrigerated. Place in refrigerator or freezer, uncovered for 15 minutes so that the chocolate becomes hard. 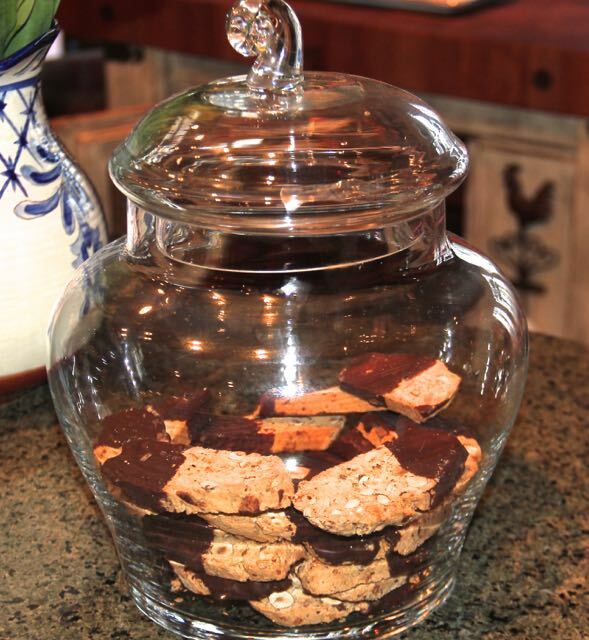 You can either save them right away--I like to display mine in a beautiful jar (see photo below)--or place them in one layer in a shallow tupperware with a lid and freeze. They keep beauctully for a long time! “paint” the melted dark chocolate on half of each biscotti, making sure to leave the bottom “unpainted” so they don’t stick to the surface. Cut each baked log into diagonal slices (about 3/4 inch thick) and place back on the baking sheet. I love to display my biscotti in a beautiful glass jar! 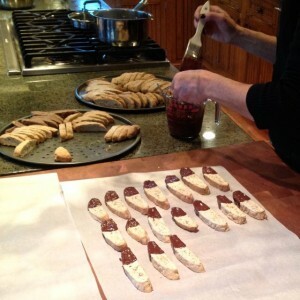 I have always wanted to try making biscotti but have a tree nut allergy. Can you think of a way to modify this recipe to accommodate that? Hi Jessica, I am afraid not! This is a recipe that is basically defined by the nuts it contains! I am so sorry about that! I am wondering if I can just rough chop the nuts…. till I get a food processor. hello! ça a l’air très bon!!! et ..joli! bonne journée à vous! ah oui, Martine, c’est délicieux et ca se garde bien dans un beau bocal comme dans les petites épiceries italiennes!! 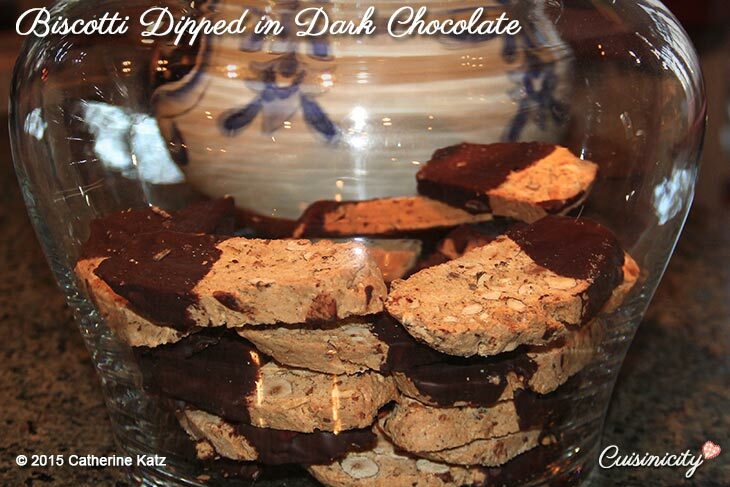 wow – I love biscotti too! These I have to try soon! You will LOVE these then Greg!! !